You don’t have to go far to see a Downtown that is changing and growing. Cranes are up, apartments are filling with residents, developers are laying plans for trendy office complexes and hotels, and startups are tapping into this energy by locating in Downtown co-working spaces. Crucial to the functioning and success of these endeavors, however, are people that you likely won’t see in headlines (except for this one). Sixty-two people work around the clock to make sure Downtown San Diego lives up to its reputation as America’s Finest City. Donning demure blue shirts and yellow safety vests, you have probably seen them, though it’s easy to take them for granted as part of the regular Downtown scenery. They are the Clean & Safe maintenance ambassadors. This crew, the majority of whom are funded by Property and Business Improvement District (PBID) assessment dollars, works diligently to ensure trees are trimmed, sidewalks are washed, gum is removed, trash is picked up, and doggie bags are stocked so that the furry members of our families can also thrive in our urban landscape. For the past couple of years, we’ve highlighted the tremendous undertaking that is the post Comic-Con cleanup. However, the maintenance ambassadors provide Downtown residents, businesses, and visitors a year-round vibrant experience. 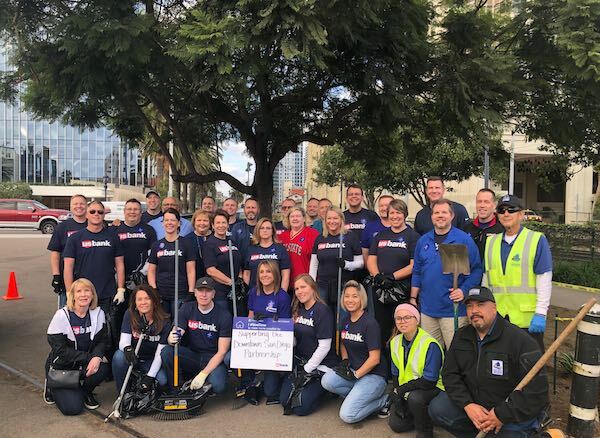 They are also called ambassadors for the critical role they play in working with community members to ensure Downtown San Diego continues to be an aesthetically clean center of culture and commerce. Collaborating with the community requires flexibility as well as proactive problem-solving. In addition to responding to issues that arise daily for residents and property owners, the team also gives community members the opportunity to be proactive in their neighborhood through weekly walkabouts on Friday mornings. And the innovation trend isn’t just limited to startups. Clean & Safe management is working on developing technology that will allow people with issues and concerns to more quickly communicate those to the team. Data from the technology will subsequently enable the ambassadors to identify and address problem areas and challenges. It can be easy to focus on the things about Downtown that we wish were different. But the ambassadors work, hidden in plain sight, to ensure that there is a clean slate for innovation, business operations, and the comings and goings of everyday life in Downtown San Diego. Don’t be afraid to offer a hello or a thanks the next time you’re out grabbing lunch or on your way to a meeting! —Lana Harrison is the communications coordinator for the Downtown San Diego Partnership. She can be reached at lharrison@downtownsandiego.org.